By P. Allen Smith | Photography courtsey of Mark Fonville and Hortus Ltd.
As a public service, I’d like to remind everyone that Valentine’s Day is almost upon us. I find the most successful sweetheart celebrations are those that have the benefit of a little planning and forethought. Spouses and partners seem to know when a Valentine’s Day gift, token, or dinner have been cobbled together, and believe me, that is not a good day. You can make this the year when you get a gold star for not only remembering the holiday, but also doing something a little different and special. It’s your time to shine. Buying flowers? Think outside the box (the box that contains red roses). Red roses are readily available for Valentine’s Day – almost too available. Unless you have a partner who has a special affinity for them, why not try something new, but equally glorious? I’m especially fond of Stargazer Lilies with their striking pink and white petals and heady fragrance. Many other cut flowers are guaranteed to delight, including miniature or sweetheart roses, tulips in a variety of colors, hydrangeas, and mixed bouquets. There are also some easy things you can do to help extend the life – and enjoyment – of your bouquet. Make sure the flowers are in a vase with fresh water. And you know the little packet of “plant food” that often comes with the bouquet? Don’t throw it away! It’s actually an effective floral preservative that contains sugar, citric acid, and bleach to help extend the life of the flowers. It’s pretty easy to give someone a bouquet of flowers, but it takes a real hero to prep the water in the vase so that the floral show is extended for maximum enjoyment. And last but not least, you are guaranteed hero status with homemade candy. I’m sharing a recipe here for Chocolate-Dipped Orange Sections with Sea Salt – an incredibly easy and relatively quick recipe to make. Consider placing in some strawberries and marshmallows next to the chocolate-dipped oranges for a delightful and romantic platter. Whatever you decide to do this year, take a few extra moments to plan ahead and maybe try something a little different. 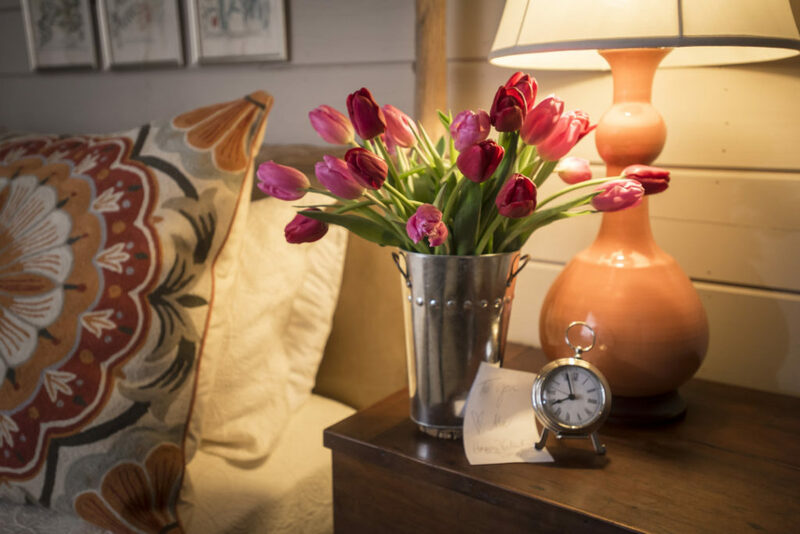 And remember that even though the joy is in the giving, it doesn’t hurt that you will also get to enjoy the fresh cut flowers, a romantic candle-lit evening, and chocolate-dipped fruit. Does that make you a hero — or a genius? 1. Peel oranges or tangerines and separate slices. 2. Melt chocolate with Crisco. Heat on low, constantly stirring until smooth. 3. Once chocolate is melted, dip orange or tangerine slices at least halfway and let them drip before placing on a parchment-lined surface. 4. Sprinkle with a pinch of salt before they are completely dried. 5. Once chocolate has hardened, remove and arrange on a serving platter with some strawberries and/or marshmallows.